At this moment, all seven Harry Potter books sit in a row on the bookshelf next to my computer. It's been awhile since I've taken them down and read them, but I'm sure, as the years continue and books come and go, those seven books will remain on my shelves. Someday maybe my kids will take them down and read them. I might revisit the stories once again, possibly sooner than later. Honestly, it's a little hard to believe that the last book, number seven, Harry Potter and the Deathly Hallows was published back in 2007. Four years already? Where did the time go? And now the movie version is nearing the end as well! 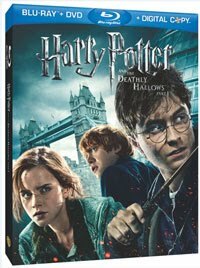 Harry Potter and the Deathly Hallows Part 1 (DVD and Blu-ray) was just released on April 15th. The final film, Harry Potter and the Deathly Hallows – Part 2, premieres in theaters this year, on July 15th. My husband and I haven't had the chance to see the Blu-ray version yet, but we're hoping to view it soon. The Blu-ray looks like it is loaded with several bonuses, including an exclusive sneak peek from Harry Potter and the Deathly Hallows Pt 2! If you're a fan of HP, you might want to visit Warner Bros. new, interactive website, Harry Potter: The Quest. Participation is free and users can play games, watch videos and earn points as a global community. When a predetermined point level each week is met, users can earn special rewards, including prizes. 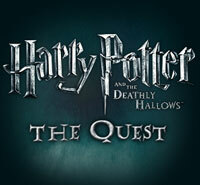 Warner Home Video is also currently sponsoring a special contest, Harry Potter: The Quest Sweepstakes. It began on April 14, 2011 and runs until June 19, 2011, and the Grand Prize winner will receive a trip for two to London, England for the Harry Potter and the Deathly Hallows - Part 2 movie premiere. More details at http://www.harrypotterthequest.com, including the complete rules. Ready for an awesome giveaway? One (1) Brimful Curiosities reader will receive a copy of "Harry Potter and the Deathly Hallows - Part 1" on Blu-ray Combo Pack! • Contest ends on Monday, April 25th, 2011 at 11:59 PM CST. 1st extra entry: Blog about this contest then post your link in the comment section. 2nd extra entry: Follow me on twitter (iambrimful) and tweet about the contest. Just bought my HPDH pt 1 yesterday and watched it last night---regular ol' DVD though, not advanced enough for blue ray here, LOL!! Hard to pick a favorite character--I think Snape played his role brilliantly, so lots of admiration there =) Keeping my fingers crossed for a "follow up" book!!! A Harry Potter related comment. I went to 4 of the seven midnight release parties. And I totally ignored my in-laws for a whole day that they came down to celebrate my birthday so I could read my book. My boys liked Harry the best, but my favorite was Hermione. Thanks for the great giveaway! Well, I'm fond of all the main Harry Potter characters, but Harry Potter himself, is my favorite. He is the central character to ALL of the books and films and so he gets my vote! :-) Thanks for hosting this contest! I appreciate the opportunity to participate. Huge Harry Potter fan! Can't wait for the last one! My favorite character is. . .I don't know, too hard to choose! I like Ginny though. We haven't seen this movie yet and would love to. Hermoine is my favorite. I'm a huge fan. I love Hermonie. I love this movie...I wish every movie had been as faithful as this one is to the book. I follow through Google Reader! My favorite Harry Potter character is Bellatrix Lestrange. JK Rowling is a genius - I wish I had 1/10 of her talent as a writer! i think the grindylows are great! One of my favorite character is Harry Potter!!!!!!!!!!! I remember while reading the book which this movie is based I actually sobbed in a few places, just knowing these characters for soooo long. Hermione is my favorite character. Oh my gosh! I'm so excited to have a chance win this for my daughter! She is 12 and a HUGE Potter fan. She would be so stoked to see this DVD over and over again. Her favorite character is Hermine. Currently, my daughter has a countdown board in her room with the days til the last Potter movie. Hi! it's me again! I subscribe to your blog. Thanks for the chance to win! My favorite characters are Sirius Black and Hagrid. I love all the characters. I think it's cool how Neville is a geek at first but turns out to be great at the end. I like Harry the best. Sirius Black is my favorite character. Hagred runs a close second. My husband loves Harry Potty and I have actually never seen any movies in the series. I'd love to win so I can finally see what the big deal is haha thanks so much for the chance! I like them all, but Harry is my favorite. Hermione is hands down my favorite! I used to wish I could be her! We adore the Harry Potter books and movies. My favorite characters are Snape and Ron! These movies are so good! My favorite creation is the garden gnome - love them running around and creating havoc in the garden, lol! Thank you for the giveaway! Harry Potter is my favorite character but I also love Dobby the Elf from The Chamber Of Secrets and The Deathly Hallows PT1. I follow you on twitter and I tweeted this giveaway. Hagrid in my favorite character. My grandson loves Harry Potter and has read all the books! omg I am sooo excited to see the final film! and check out my blog for some low entry giveaways! I love Dobby, he is perfectly recreated in the movie from the book! I like all the main characters of course. But, I also like Dobby. My 6 year old is Harry Potter CRAZED. We have a really cool Hagrid LEGO set. So...maybe hagrid can be my fave? would highly recommend the potter audio books read by jim dale. he does a great job, they're a joy to listen to. I love Hagrid's dog "Fang" . I would love to have this Blu-Ray pack - Severus Snape is my favorite character from the series. My favorite character is Hermione. I love all the Harry Potter characters, but Hermione is my favorite. Thank you for the great give-away. Thanks for the giveaway! I love HP, and I think I'm going to be borderline depressed at the end of the series. I love love love the whole series of books and movies!!! What a fun movie! This would be great to add to our blu-ray collection! Hermione fan - nice to see her putting the boys to shame. I love Dobby--I really want my own house elf! I love tough female characters so Hermione is my fave! I love all of the characters and the roles they must play. I think I absolutely love Alan Rickman's portrayal of Snape. I think he nailed it! We heart Daniel Radcliffe as Harry Potter! This is my first true blog and I did it all for a Harry Potter movie. My favorite character is Harry! I love the part in the movie when all his friends change into Harry. I am 54 year old mom who finally read my first Harry book and loved it! Aw, who doesn't love Hagrid? The Harry Potter trailer looks as good as most sci-fy-type film--and I like science fiction. I waited until after the first movie to read the first book, and until I'd seen the second movie to read the second book. Then I devoured everything that had been published up to that point. I waited eagerly for the final two books, bought them on the day of release and started reading them while we were walking around the store (it was Sam's Club). Nothing else has excited me like that since "Star Wars." Hagrid has always been my favorite. Snape is my favorite. The whole family love the Harry Potter series.